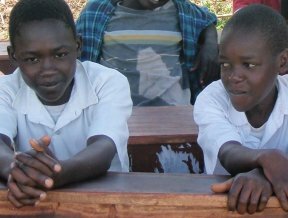 The schools work hand-in-hand with their local communities, who have helped to clear land, make access roads, bricks and furniture from local materials and with building work. Those children who can afford to pay a small amount in school fees, but this represents a small proportion of each school’s running costs. Teachers and other staff are working for very little pay – but they are hoping that things will improve in future. Longer-term outside assistance is crucial if the schools are to be able to: recruit orphans and students from families with little or no cash income, provide reasonable pay and conditions for teachers, raise the standards of education through the use of books and other learning resources and improve school buildings and infrastructure to create an effective learning environment. The schools have come a long way in a short time but they are struggling to meet the high ideals they set for themselves. By becoming a supporter you can help to ensure that the schools succeed and provide a model for the development of high quality secular-Humanist education elsewhere in Africa and worldwide. Untied cash donations allow us to direct money to meet the greatest need at the time. To donate now.